Paul Rudd is an American actor, comedian, and screenwriter. He joins the likes of Steve Carell and Seth Rogen as some of the best comic actors in Hollywood. Rudd has exhibited his comic talents (which is guaranteed to leave you in stitches) in several unforgettable movies. They include Anchorman: The Legend of Ron Burgundy, The 40-Year-Old Virgin, Knocked Up, and I Love You, Man. Rudd also belongs to the select club of actors who have played superhero roles. Since 2015, he has portrayed the size-shifting superhero Ant-Man in several movies. Find out more about Rudd here including facts about his wife and kids, height, net worth, and other interesting facts about him. 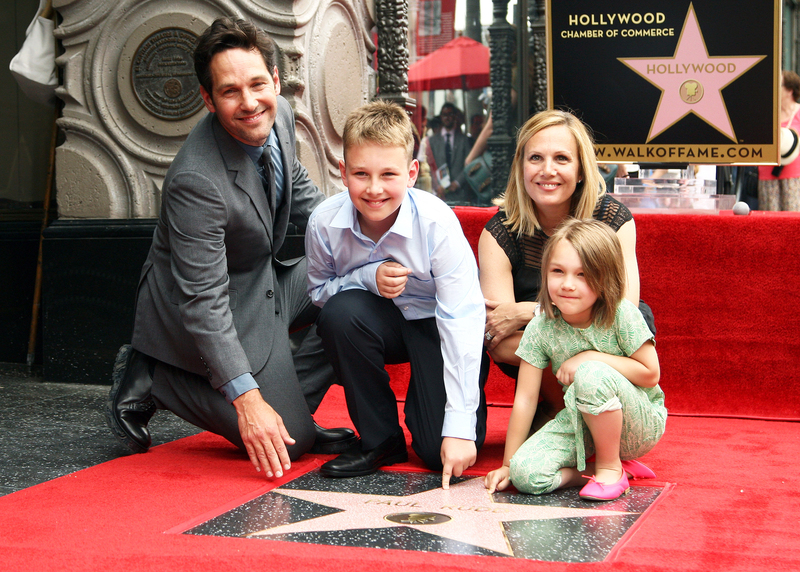 Paul Stephen Rudd was born on the 6th of April 1969 in Passaic, New Jersey. His father’s name is Michael while his mother’s name is Gloria. He also has a younger sister named Mandy. Rudd’s dad worked for an airline and as such, the family moved around a bit. They eventually settled down in Kansas and Rudd completed his education at Shawnee Mission West High School in 1987. After that, Paul Rudd attended the University of Kansas to study theater. Upon graduating, he proceeded to L.A. to pursue his acting career. Paul Rudd got his debut role in 1992 in the TV drama, Sisters. Between 1992 and 1995, he appeared in about 20 episodes of the show. Whilst appearing in Sisters, Rudd landed a lead role in the 1994 TV series, Wild Oats. Even though Wild Oats only lasted four episodes, it nevertheless helped Rudd to land his next role. This came in the 1995 cult comedy, Clueless, where he plays Josh the stepbrother/love interest of the main character. The role proved to be his breakthrough role and brought him to the limelight. Since that breakthrough, Paul Rudd has never looked back. He has racked up appearances in some of Hollywood’s most successful comedy movies. Rudd has also featured in some serious fare including the 2018 movie, The Catcher Was a Spy. In it, he plays a Jewish baseball player who becomes a government spy in order to hunt the Nazis. Paul Rudd has a net worth of $30 million. He made his money from his movie career as well as several endorsement deals. He has appeared in commercials for big brands such as Hyundai, Super Nintendo, Samsung, and Miller Lite Beer. Blessed with good looks and an award-winning smile, it is not surprising to see that Rudd is in hot demand for commercials. The Ant-Man star is married to Julie Yaeger. Yeager is a former publicist but is now a screenwriter. The couple first met in 1998 when Rudd came to the office where she was working. He was running late for an audition and she assisted him with his luggage. He later asked her out and the rest, as they say, is history. The couple got married in 2003 and are very private about their family life. They have two kids together; their son Jack born in 2006 and their daughter, Darby, born in 2010. Paul Rudd is 5 feet 10 inches tall (1.78m) and weighs 78 kg (172 lb). He has dark brown hair and green eyes. Other additional measurements are chest – 40 inches, biceps – 14 inches, and waist – 30 inches. Rudd belongs to the category of actors who never seem to age. During the 2019 Oscars, many movie fans commented on his ageless looks. Some said that there is not much difference between how he looks now and how he looked way back in 1996 when he featured in Clueless. Many fans took to social media to ask him to reveal his secret. Others suggested that he may be a vampire. Whatever be the reason, there is no doubt that Paul Rudd looks good for a man of his age. 1. Paul Rudd is Jewish. His parents are descendants of Jewish immigrants. His father’s surname was originally Rudnitsky but was later shortened to Rudd. Paul’s wife, Julie, is also Jewish. 2. Rudd’s dad passed away in 2008. He died of cancer. 3. Apart from studying theater in college, Paul Rudd attended various schools to hone his acting skills. They include the American Academy of Dramatic Arts, L.A., as well as the British American Drama Academy in Oxford, England. 4. Rudd worked various odd jobs after college. This was in a bid to save money for acting school. They include newspaper delivery, groceries bagger, DeeJaying, etc. 5. The actor has revealed that the worst job he has ever had involved him glazing ham with sugar. This was when he was employed at the Holiday Ham Company in Overland Park, Kansas City. 6. Rudd has appeared in several Broadway plays including Twelfth Night and Three Days of Rain. 7. The man has received many awards in the course of his career. He has also been awarded a star on the Hollywood walk of fame. This was on the first day of July 2015.